Why does the event owner not get notifications if products from the gift event were purchased? The Gift Registry Add-On integrates an amazing registry service into your online store. It allows your customers to create a wish list for any happy occasion with items from your store and share it with their friends. Your store offers a special service for the customers: each customer can create events and add a list of the products they wish to get from your store. 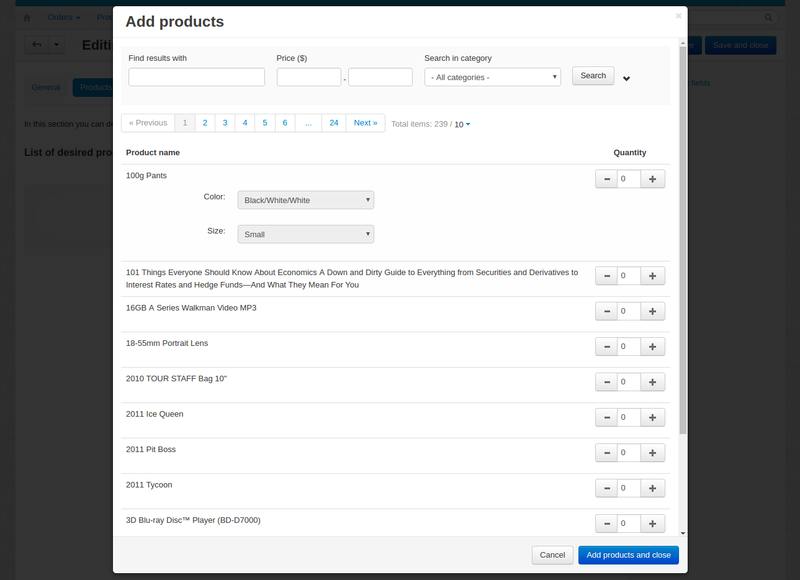 Other users can view created events and purchase products from any wish list. These products will be sent to the event owner. Events can either be public (available to all users) or private (available via an access key sent to certain users). The Gift Registry Add-On enables you to create a unique place in your store where customers can communicate with each other. This will promote the store and extend the customers’ community. 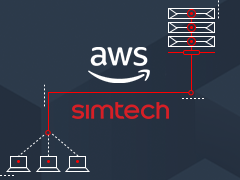 The add-on is compatible with CS-Cart and Multi-Vendor 4.1.2 and above. Check out the Gift Registry add-on in our demo store. Install the “Gift registry” add-on on the add-ons list page (“Addons” → “Manage add-ons”). With the help of the settings of the “Gift registry” add-on, the store administrator can set the ability to create events for users, specify the number of elements in the “Today’s events” block (you can find more information about the block in the Blocks of the “Gift registry” add-on section), set user notifications and specify the size of images (both in the events list and on the details page of an individual event). If your CS-Cart or Multivendor store runs on versions 4.3.1-4.3.6, you’ll need to insert a hook to make the add-on perform correctly. Events are managed on the “Events” page (under the “Customers” → “Events” section). On this page, the store administrator can create new events, edit and remove existing events. 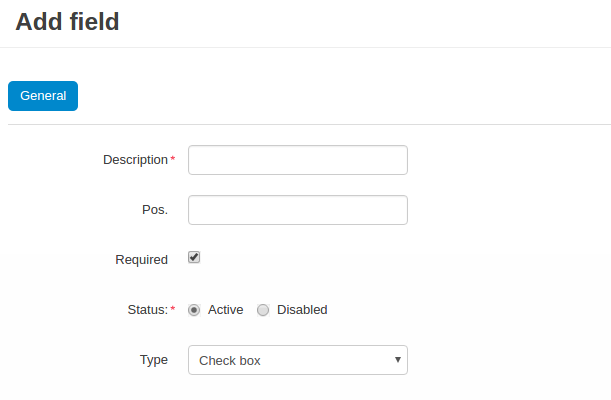 Besides managing events, the add-on allows the store administrator to create new fields for events. To get to the managing event fields page, please use the “Custom event fields” link on the right. 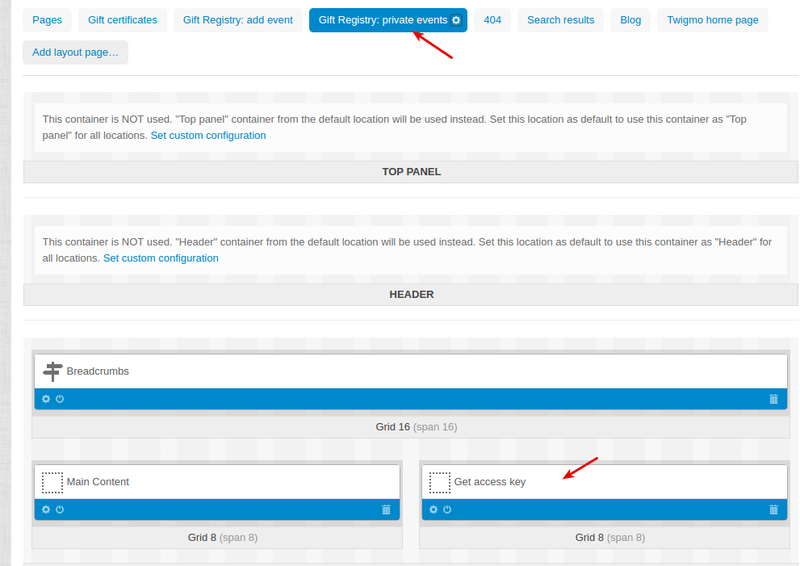 For more information about event fields, proceed to the Custom event fields section below. When creating a new event, the store administrator should input general information - event name, contact e-mail, event type (public, private or disabled), image, etc. In addition, in the “General” tab the store administrator can create a list of invitees. Any person can be added to this list, not only the one who is registered in the store. The editing event page differs from the creating new event page in two additional tabs - “Products” and “Notifications”. In the “Products” tab it is necessary to define the products to be displayed on the details page in the Gift registry for customers section. A list of event invitees is displayed in the “Notifications” tab. In this tab the store administrator can send notifications to invitees. 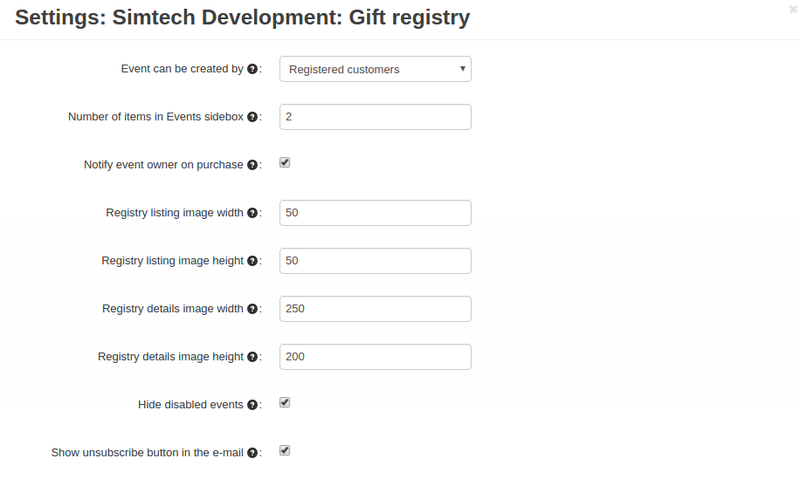 Besides the standard set of event fields, the “Gift registry” add-on allows to create additional ones. To go to the custom fields list page, please use the “Custom event fields” link on the right. A wide range of available field types allows the administrator to create new fields of the select box type, radio groups, date, etc. 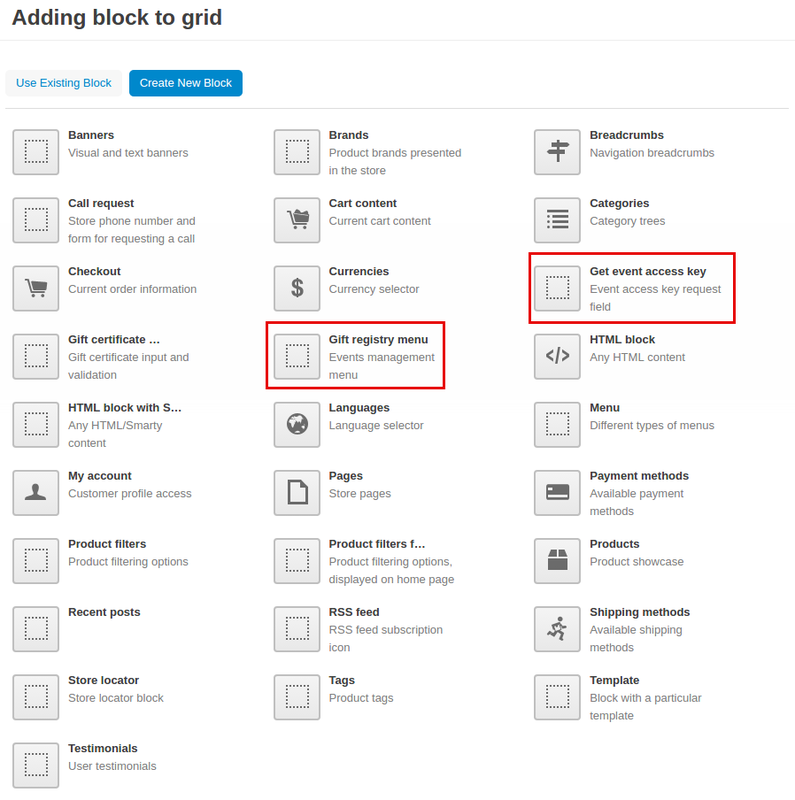 The “Gift registry” add-on allows to create two new blocks - “Gift registry menu” and “Gift event access key” (in the “Design - Layouts” section). The “Gift registry menu” block allows to display a list of events available at the moment in the customer area. The number of elements displayed in the block is set in the add-on setting (see Available settings). If the number of available events exceeds the value defined in the “Number of items in Events sidebox” field in the add-on settings, the “More…” link will be displayed besides the events list in the block. By following this link the customer will get to the page of the list of events available at the moment. As specified above in the Creating and editing events section, there are two event types available in the customer area - public and private. However, private events will be accessible by a secret key only. The users invited to a private event may need to get an access key to the event additionally. The “Get access key” functionality is provided for this, it is implemented in the “Gift event access key” block. (Users can see this under their account in the Events section in the Private events tab). When the add-on is installed, two layouts are created automatically. Blocks can be set for them. It is logical that the “Gift event access key” block described above should be located on the “Gift registry: private events” layout. In the customer area, a list of all events is available on the “Events” page (please see “My Account” → “Events”). On this page, users can view a list of available events and create their own ones. Also, Searchbox is available to the users, it is a powerful tool for searching events. and complete all of the necessary fields. 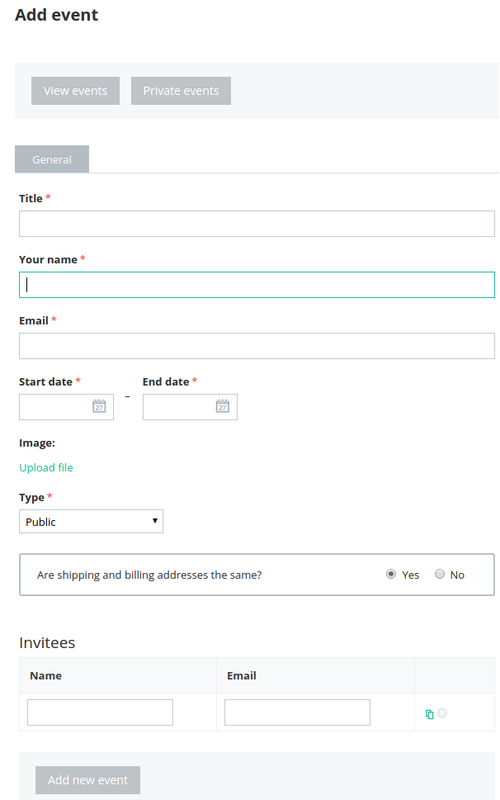 Also, when creating a new event, the user can create a list of invitees. 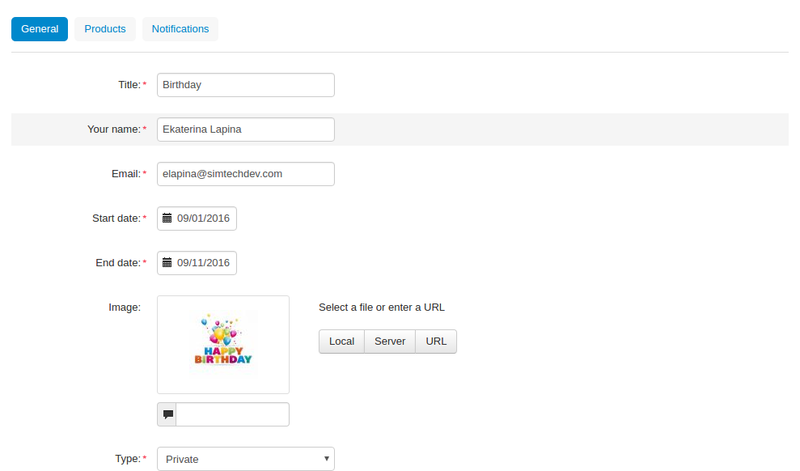 After an event is created, the user will be able to send e-mail notifications to all the invitees. At this step the process of creating a new event is not completed. Besides general information it is necessary to add new products for the event. You can read more about it in the Editing the existing event section below. The editing event page is like the creating a new event page. However, additional information will be available to the event owner besides the general information in the “General” tab. First of all, the access key will be displayed in the “General” tab besides general information. Using this key the invitees will gain access to private events. In the “Products” tab, the event owner can manage the list of products related to the event - add/remove products, change the quantity, etc. In addition, the event owner will see what products have already been purchased. In the “Notification” tab, the event owner will be able to send e-mail notifications to the invitees. 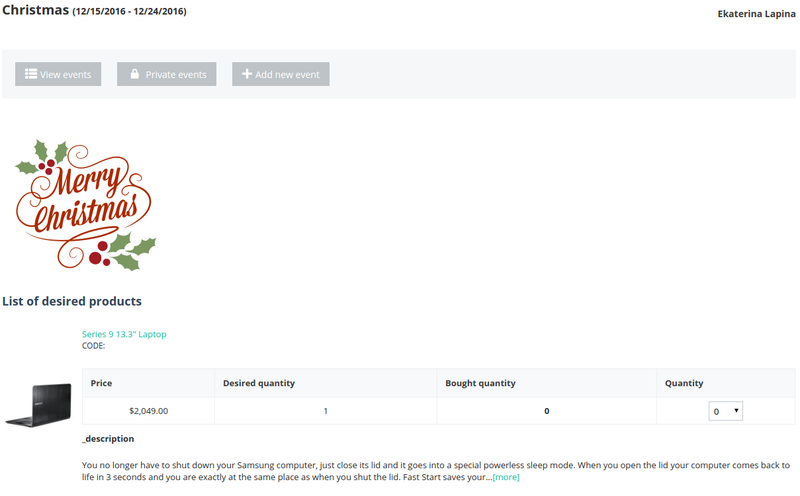 As described above, it is possible to add products for an event on the event details page. Moreover, it is possible to add products for an event on the product details page, please use the “Add to registry” button for this. 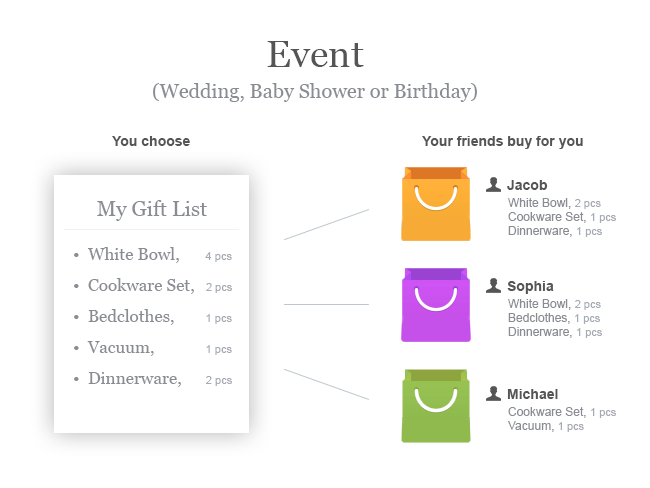 If a user creates several events, they will be offered to select the event, for which they want to add a product. 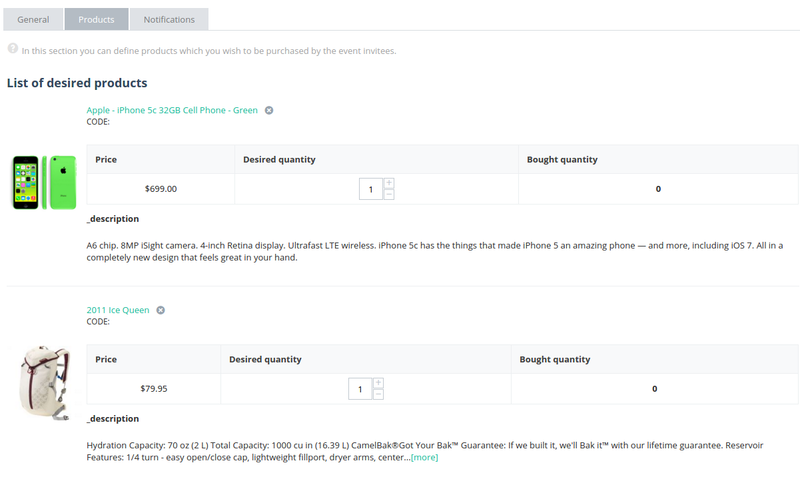 The appearance of the event details page for customers differs from the appearance for the event owners. 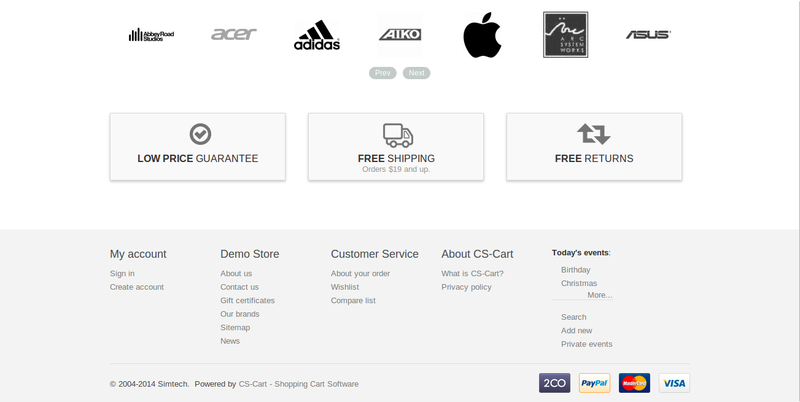 Only the logo and products list are displayed on this page. The users can purchase the products related to an event. These products will be shipped to the event owners. To view the details of a private event, users should enter an access key. To get an access key to a private event, it is necessary to send a request using the “Get access key” form. The “Notify event owner on purchase” option should be selected in the settings of the Gift Registry add-on. The “Notify event owner” option should be selected in the order status settings. So when the order status changes (for example, to Processed), the notification will be sent to the event owner.